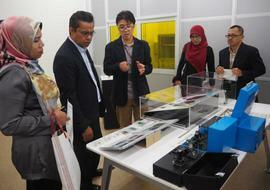 On October 11, TUT was visited by four members of the University of Technology (USM), Malaysia. On this occasion, while the group from USM were already visiting Japan for the purpose of an exchange program with Shizuoka University, as the group have also entered into a university exchange agreement with our university, they paid us a visit as part of a staff exchange venture. 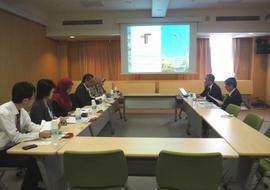 During the visit, in addition to being provided with an outline of the university, being given an explanation of the university's Research Institute for Science & Technology Innovation (RITI), making a courtesy call to Chief of Secretariat Kojima, and taking part in an inspection tour of the Electronics-Inspired Interdisciplinary Research Institute (EIIRIS), the UTM members were able to engage in discussions with TUT regarding potential future exchanges between the two universities.